Lakenvelder owners raise the breed primarily for egg production. Hens lay three medium, porcelain white eggs as week. An active breed they have little time for brooding and will seldom sit a nest. They enjoy foraging and will cover a large area if allowed to do so. Lakenfelder go easy on the feed pocketbook. With adequate space they gather most of their own food. Their origins from the Middle East might lead one to assume that Lakenvelders could only survive in warmer climates. However, they have thrived in Europe for decades and adapt to a wide range of weather. They have delicious, white meat, albeit, minimal in quantity. Lakenvelder chickens have many of the temperaments common with foragers. Owners describe them as quick, intelligent, wary, and at times flighty. Foragers survive by their wits. The Lakenvelder adapts well to their environment. They love to forage but will adapt to confinement if thrust upon them. Lakenvelder chickens get along with each other in close quarters. Owners use the common term “docile” to describe the chickens behavior toward each other and toward their human handlers. The word “Lakenvelder” describes the general appearance of the breed. It literally and poetically translates as “shadow on the sheets.” Lakenvelders in general have a white body with black hackles and tail. 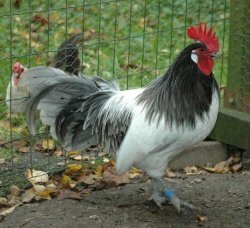 The rooster may have a black and white mix on their saddle feathers. The hen sometimes has white feathers mixed in their hackles. 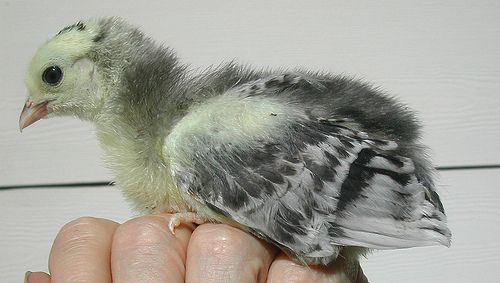 The American Poultry Association (APA) only recognizes the Silver Lakenvelder. Europe accepts other configurations such as the Golden Lakenvelder and Blue Lakenvelder known as the Vorwerk. The Lakenvelder averages four or five pounds. The bantam version average two pounds. As egg layers your Lakenvelders need calcium and protein supplements to their diet. Feed them a good layer food. Lakenvelder forage great distances. Give them as much room as you can afford. They will reward you with lower feed costs. An active breed, the Lakenvelder lays much and broods little. They make the perfect egg layer except if you want to propagate the breed. Bring in a good brooder from another breed or an incubator for hatching. Although adaptable, provide a well insulated, draft free coop for your Lakenvelders. 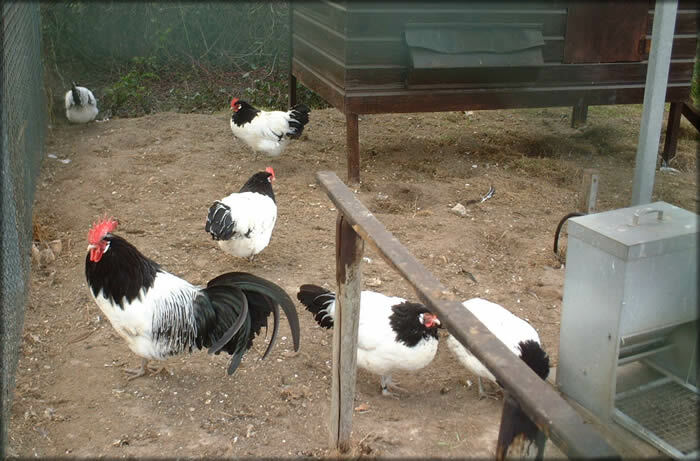 Breed experts know the Lakenvelder as that German chicken with the Dutch name from Palestine. The stories vary but in essence it appears that the Lakenvelder came with immigrants from Egypt and Persia into Palestine around 2000 BC. They developed there and had the name Tel Mediggo fowl. Roman Jewish immigrants brought them with them to Westfalen Germany around 1 AD. The bred later developed in Lakervelt, Germany just over the border from Holland. One can see the similarity in the name Lakenvelder and Lakervelt. Add a Dutch accent, and you have a new breed a chicken. The breed arrived in America in 1900 and gained acceptance into the American Poultry Association’s Standard of Perfection in 1939.